Special thank you to Naturally More for sponsoring this post. As always all thoughts and opinions are 100% my own. It doesn’t matter if it’s the summer or middle of the winter, my family LOVES popsicles! 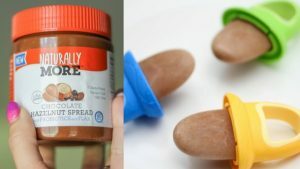 I felt like it was time to try something new so I decided to whip up a delicious chilly treat made with our favorite hazelnut and chocolate spread from Naturally More (& it’s perfect for all my gluten free and plant based diet homies). If you are wondering…the Naturally More products are gluten free, dairy free, vegan, non-GMO and have no trans fat. I’m newly trying out plant based eating to see if it will help my arthritis. So far it really has. I’m amazed! I cut out diary and gluten prior to this due to my IBS and also noticed by dropping those things my anxiety level significantly reduced. So why not cut out more food to see if I feel better, right? Anyway, I think you will LOVE these vegan & gluten free fudgsicles. Plus they are so easy to make. Pour 1/4 cup Naturally More- Chocolate Hazelnut Spread in to a small mixing bowl. Pour 3/4 cup almond milk into the bowl and whisk together. Add 1 tsp cinnamon and continue to whisk until fully mixed. 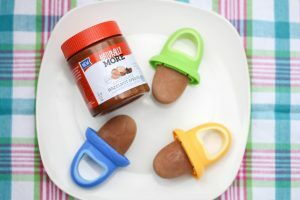 Pour mixture into a popsicle mold and place in freezer. Give it 6+ hours to fully freeze. I hope you enjoy these delicious treats guys! We sure do! Very cool recipe! Great alternative to homemade fruit pops! Who doesn’t love chocolate! I can’t wait to try these they look amazing!!! This recipe sounds easy! 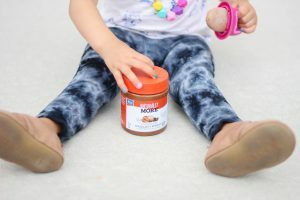 My kids are peanut butter fanatics and I love alone butter so I’d love to check out this brands options! Yum! I will definitely be trying these! I’m definitely trying this! I’ve given up dairy and I miss fudgies so much!!! Yes! If you like yours very sweet add some liquid sugar to it or honey. What a yummy summer time treat! 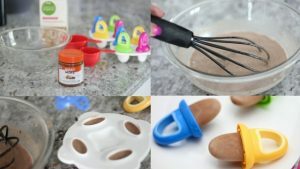 These look easy and delicious and I bet my kiddos would LOVE them!!! I think I would love these as much as my kids would! Yum! That’s funny, I was thinking the same thing. I might make a batch for mama.